The Albuquerque, NM-based Upsite Technologies, Inc.® will be exhibiting in San Antonio, TX from March 12-15 at Data Center World Global 2018 – a gathering of more than 1,000 data center, facilities, and IT professionals. Upsite is known for engineering unique product and solutions to optimize airflow in the data center. Products Upsite will have on display will be a selection of KoldLok® brush floor grommets and HotLok® rack blanking devices, including their popular SwitchFix® which improves airflow to network switches. Additionally, Upsite will be showcasing the newest addition to their modular containment line, the AisleLok® Sliding Door. These Sliding Doors install without tools and help reduce IT equipment intake temperatures in just minutes after opening the box. 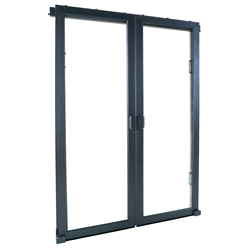 The Sliding Doors also feature exclusive MagSwitch Technology and can reduce operating costs by improving thermal efficiency. “Data Center operators have been deploying our products since 2001 to optimize data center airflow, so we are delighted for the opportunity to engage with end-user customers and resellers at this highly attended industry event,” said Al Zoldos, President of Upsite Technologies. To learn more about the SwitchFix, Sliding doors or other Upsite products, visit with them during DCW Global 2018 at the Henry B. Gonzalez Convention Center, Exhibit Hall A, booth #518 starting at noon on Wednesday, March 14 and Thursday, March 15. Known as the “pioneering company in airflow management solutions” Upsite Technologies, Inc. was founded in 2001 by Ken Brill, who in 1993, had established the Uptime Institute, a think tank dedicated to understanding, improving, educating and expanding awareness of uptime and optimal efficiencies in data centers. Upsite continues to engineer, design, and manufacture precision sealing solutions as a part of our award-winning, patented family of solutions - KoldLok, HotLok, AisleLok, and EnergyLok®. Upsite Technologies’ products and services empower data center managers to leverage cost savings and improve vital elements of data center operations. The company partners with proven leaders in the data center airflow management industry throughout the United States, EMEA, and Asia Pacific markets. Magswitch Technology’s culture of innovation relies on collaboration with other technology integrators to advance our products into the future. Every Magswitch product is proudly designed, developed, manufactured and tested by Magswitch to ISO 9001:2015 standards. For more information about the company and its related products, visit http://www.magswitch.com.au or call +1(303) 468-0662.